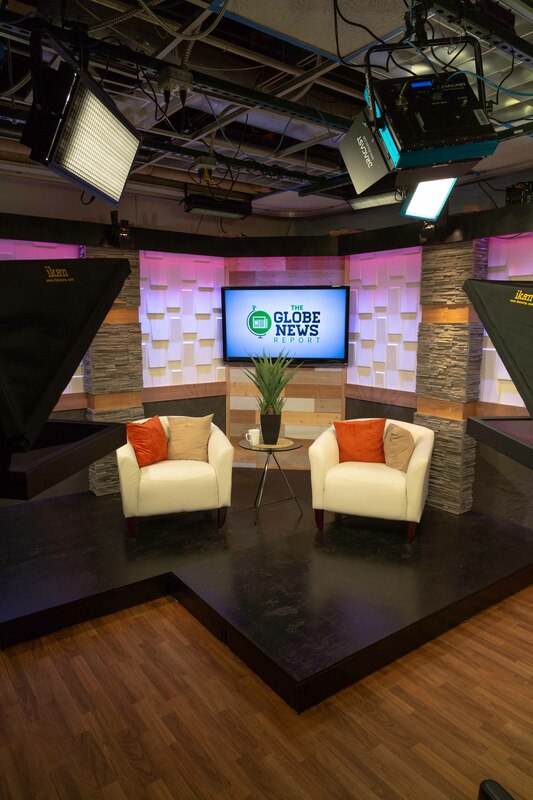 The newly-renovated Globe TV studio. 91.1 The Globe (WGCS) will launch a new website and video broadcasting platform, called Globe TV, to add new content to the station’s programming. The official launch, including a tour of the newly-renovated 4K TV studio, will take place Monday, Feb. 11, 2019, in the Good Library. 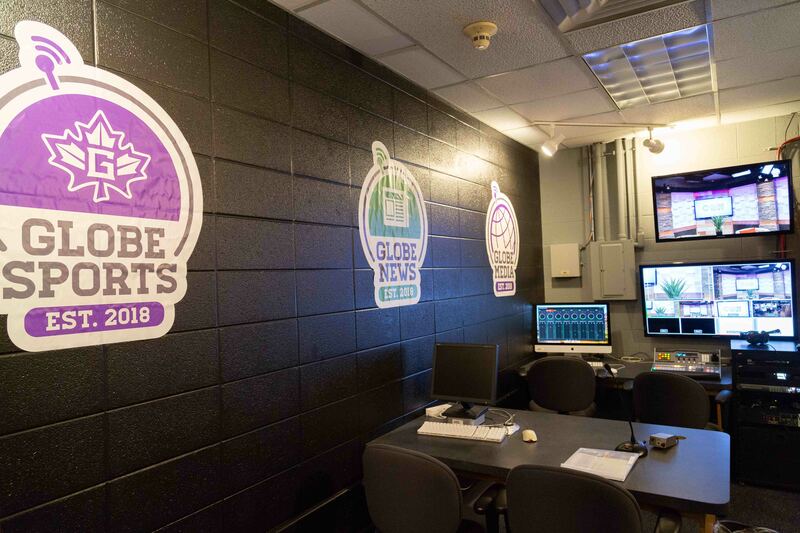 Globe TV will consist of Globe News, to provide more Goshen community news, and Globe Sports, to add more video to its award-winning Goshen College Maple Leaf Athletics coverage. Globe News, in addition to the radio news reports, will add video stories featuring human interest and music news in and around the Goshen community. New video stories will appear weekly on GlobeRadio.org and a monthly TV studio show, “The Globe News Report,” will recap the months best stories. Globe Sports will also add “The Globe Sports Corner,” a weekly studio show with in-depth video features and interviews with athletes, coaches and administrators, to the station’s coverage of Maple Leaf Athletics. Globe general manager and radio broadcasting professor, Jason Samuel, said that the addition of video is important to Globe Sports. The newly-renovated Globe TV editing studio. “The Globe News Report” and “The Globe Sports Corner” programs will be filmed in a newly renovated 4K television studio on the Goshen College campus. New sets were designed and built with the help of faculty, students and community volunteers. The studio also got a technical upgrade with new 4K ultra-high definition cameras, LED studio lighting and control room technology. This is the only 4K TV studio among colleges in the Crossroads League athletic conference. An open house for the renovated studio will be held Monday, Feb. 11, from 3-5 p.m. to celebrate the launch. The event is open to the public and the studio can be found in the bottom floor of the Good Library on Goshen College’s campus. The Goshen College Communication Department has been recognized in the state and nation for its excellence in broadcasting, journalism, speech, film production and writing. The department has been named Indiana TV and Radio school of the year multiple times, Best College Radio station in the nation twice, Indiana Broadcasters Association Best Radio Station, Best College Newspaper in the state and many more. Students from Goshen College’s Communication Program get hands on learning opportunities with the department’s co-curriculars like, The Record, PRSSA, WGCS 91.1 The Globe, FiveCore Media and GCTV. To learn more visit www.goshen.edu/communication and globeradio.org.